"It was known that Lasseter had buried three films and a kit bag under a camp fire". Cartwright, Max. Ayers Rock to the Petermanns.57. Lasseter's buried kit-bag and it's rediscovery is a fine example of rumour becoming fact and the fact once established financing several very expensive holidays to Lasseter Country, definitely a case of creative history. The story began on 27/12/30 when Lasseter's camels bolted somewhere in the sandhills north west of the Cave on the Hull River. He writes in page 70 of his Diary, "I've pegged the reef & marked the exact locality on the map which is buried in my kit-bag on the sandhill where the camels bolted - On the east side of the hill", and a couple of pages later, as an afterthought, "I buried 3 rolls of film in a 5 lb treacle tin on the sandhill too". So, by the end of October 1931 all Australia knew that the directions to an exactly mapped reef were buried in an unmarked sandhill somewhere in central Australia, and the only photographic evidence was last seen months ago, besporting the Aboriginal girls as fashion accessories??. No wonder many of us doubt the provenance of that Diary, There's something wrong with the context of it. But there it is, supposedly written in Lasseter's hand, and it's the only map and just three rolls of film. You would think he'd make a point of carrying £200,000,000 worth of information on him to the end. Yet he buries the evidence. Gad!! But the twenty years between the kit-bags burial and rediscovery gave time for a quirky bit of Centralian folklore to mature. Likely beginning on 29/03/31, the day Bob Buck poured Lasseter into his grave at Shaw's Creek. It soon became widely known that Lasseter had cut strips of leather from the kit-bag to repair his boots, thus explaining Buck's difficulty in tracking the missing prospector. Fortunately for history Walter Gill recorded something of the foundations of this delightful myth. Over a breakfast cuppa' at Hermannsburg on the 4th of May 1931, Gill took the opportunity to question Buck in a fairly circumspect fashion, (Gill assessing Buck as that sort of fellow) about recent events out west, remarking that the dry conditions must have made tracking difficult. The question seemed to surprise Buck, "Funny you sayin' that. The only tracks we saw was so smudgy they could have bin anythin". The Aboriginals told Buck that Lasseter had made the tracks, "when he was wearin' strips of leather for boots. They said he cut 'em from the side of the portmanteaux". At this point in the discussion Gill's doubts about Lasseter's bushcraft were confirmed, recalling the damper story and now Lasseter carrying a portmanteaux, "I suppose it was because I had never met a man out bush carrying one, and I was fascinated by the mental picture of those dabs in the sand". The following day Gill broached the subject of Lasseter to some old timers in Alice Springs and if it were possible for Lasseter to do what he claimed to have done in 1897 or thereabouts. The reply was emphatic, "Bollicks! ~Too bloody far for a new-come-up who couldn't cook a damper and travels with a portmanteaux". The bush had cast it's opinion of Lasseter. Portmanteaux, kit-bag and valise are all much the same, except for size, a item of stout leather baggage for carrying clothes and personal effects, hand luggage so to speak. One can understand Gill having doubts about Lasseter's sanity and Bob Buck's yarns. Did Lasseter return to his buried kit-bag to effect boot repairs? Of course in May 1931 none were aware that Lasseter had buried his kit-bag in a sandhill, that did not become apparent until October 1931 when the second C.A.G.E. Expedition unearthed Lasseter's Diary in the Cave. Leaving Buck 'n' Idriess an awkward moment in history to explain! What came first? the kit-bag or the footprints?. Over the years the story took on legitimacy of sorts, given currency by Walter Smith and increasing contact with those Aboriginals who had witnessed Lasseter's misfortunes. Smith claims to have been in the area shortly after Buck buried Lasseter and had to rebury the corpse as Buck had not done a thorough job, "dingoes had dug down and dragged a leg off". According to Smith this was Lasseter's third burial. Smith, who was guide to the 1931 Eclipse Expedition and with deep Aboriginal affinities soon enlisted the help of the Pitjantjatjara in backtracking Lasseter to Lake Christopher, oddly enough following the tracks of the two camels that he had lent Lasseter and Johns back in July, the previous year. Because of his Aboriginality, Smith learnt much more than Buck about Lasseter's movements and followed the trail closely and also learnt the reason for Lasseter's faint tracks. No one has admitted to the utter foolishness of searching for Lasseter's kit-bag in which sandhill?? although many of the hundreds who have searched for the reef have probably given the sandhills about five miles northwest of the Cave more than cursory attention...yes it would be very helpful in the search for the reef if the vital map and kit-bag could be found in a more convenient location. And that's precisely what happened, about twenty years after Lasseter buried his kit-bag in a sandhill, the priceless artefact was found buried under a camp fire on the banks of the Hull River, opposite Lasseter's Cave, a pleasant camping area and notably bereft of sandhills! In 1950 an ex Lord Mayor of Sydney, by the name of Neville Harding, tried his hand at a Lasseter scam, and ventured to the Petermanns, searching for the reef and other Lasseter ephemera. Clued up with the usual 'secret bearings' decoded from diaries and notes found in buried pickle bottles. In due course the Harding Expedition arrived at Lasseter's Cave and thoroughly turned over the debris on the floor of the now historic refuge. Nothing was found, which is not surprising, the place would have been sieved to a fine powder after twenty years of fossicking. The afternoon of the cave dig found a disappointed party sitting about a camp fire reviewing their options when Harding had a "brilliant idea", he asked the expeditions Aboriginal guide if Lasseter had camped elsewhere nearby when not holed up in the Cave. Barney, "indicated the other side of the Hull, directly opposite the cave". The quotes are from a book by Max Cartwright, titled 'Ayers Rock to the Petermanns', a useful reference for serious Lasseterians, and if I may, I'll continue to paraphrase Mr. Cartwright's involvement in the discovery of Lasseter's kit-bag. At the time the expedition was aware that Lasseter had buried a kit bag somewhere, probably containing three rolls of film and that all important map. So with "renewed hope" the party crossed the Hull River to the opposite bank and excavated three old camp fires, only visible to Barney. "In a short time we were rewarded when some rotted tins, three films, and the remains of a semi-fossilized leather kit bag were uncovered". And to prove it was the right kit-bag, the bottom section was missing, "according to Walter Smith's story, Lasseter used to make straps for his shoes or feet"!!. So Barney and his people knew for all those years where Lasseter had buried his kit-bag and no one had bothered to ask...except Harding!! I don't doubt Cartwright's account of the kit bags miraculous discovery, but the provenance of the bag and Harding's motives are suspicious. No one on the expedition bothered to question the translocation of Lasseter's kitbag from the 'sandhill of bolting camels' circa 1930 to the banks of the Hull River twenty years later, or for that matter the reappearance of three rolls of film last buried at the back of the cave and probably long gone as Buck observed all those years ago. And at the time of Lasseter's misfortunes, no camp fire abandoned by a white fellow would remain undisturbed for much past 20 minutes much less twenty years, Lasseter's every move was watched by the Aboriginals and all camp fires, no matter how well disguised, were dug up for the valuable glass and metal and a leather kit bag with metal containers and fittings would be a prize indeed. Harding's credentials are questionable for a number of reasons, and as he kept the company of Morley Cutlack the explanation for this truly serendipitous discovery of Lasseter's kit bag may be nothing more or less than a simple fraud, guaranteed to generate well sponsored trips to central Australia and some shareholders funds to speculate with. Harding's 1967 return to Lasseter's Cave was a full blown safari, largely financed by the discovery and mystique of the kit-bag. 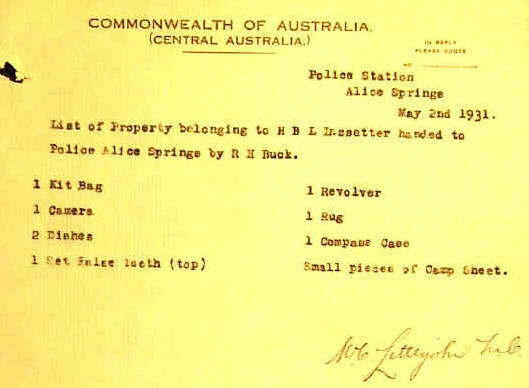 Lasseter's kit bag was probably planted under the camp fire by Cutlack on one of his many illegal forays into the Petermann Ranges during the late 1930's, possibly 1938. Cutlack was also a director of a very speculative gold exploration company named Centralia Holdings. In due course Cutlack's trespasses into the Aboriginal Reserves came to the attention of the Authorities and he was no longer welcome in central Australia. About 1950 Cutlack sold his interest in Centralia Holdings to Neville Harding and amongst the company's meagre assets was a 'waiting to be discovered' kit-bag that Cutlack didn't get to exploit because of past misdemeanours. This ruse is no different in principle to salting goldmines, a practice Cutlack was familiar with. Harding wasted no time cashing in Centralia Holdings only 'in ground' asset and on his first expedition into Lasseter Country went straight to the kit bag. He made sure the bag and other Lasseter artefacts received suitable publicity, good for several spurious adventures to the Centre. And it seems Harding and many others have 'misinterpreted' the sequence of events in Lasseter's Diary. At page 23 of his famous notebook Harry regrets burying the film under the camp fire on the sandhill, "blistered and burnt with the heat. I ought to have buried them in the cave". The problem is solved at pages 39 and 40 when the Pitjantjatjara bring the rolls of film to Lasseter who reburies them at the top end of the cave, "I scratched the hole out last night when I feel sure they were not about". As I read this again a niggardly contradiction has clarified itself---In one sentence Lasseter writes of Aboriginal goodwill in returning the film (and significantly, no kit-bag with map or treacle tin, just the film) and his utter distrust of them by hiding the film again! Now that's paranoia. But as far as Lasseter was concerned his films remained hidden at the end of his Cave and not under a camp fire this time!...at least until his Diary was reinterpreted by Harding. It seems that Harding and others have ignored the implications of pages 39 and 40 and have decided to leave Lasseter's rolls of film with the kit-bag, buried under a camp fire outside the Cave and not in some unidentifiable sandhill, a shady river bank sounds far more salubrious. As one old old timer observed, "Twenty years searching and they can't find a bloody great gold reef fourteen miles long, yet less than twenty minutes digging and Harding unearths Lasseter's kit-bag...now I ask you?? But that's why we like Lasseter up here in the Centre; long gone, yet every so often he comes up with something to amuse us, the money's not too bad either". There's a couple of footnotes to the story, as with most things Lasseter. Page 70 of the Diary like several others, has been damaged by fire or the elements, and the word 'bag' has been obliterated, the common extension 'kit-bag' is obvious. What concerns me is not the word missing but the page existing. Except for the name there is no connection between Neville Harding and Lasseter's Harding, the latter never existed. The Harding's, and there are several of them, are dealt with elsewhere. And a last point, like the camera, the kit-bag and rolls of film probably only existed in someone's imagination, but by being mentioned in the Diary they have substance and therefore will be found...eventually. And were Barney about today I would have a few questions for him you bet! From Ion Idriess's autobiography of his early years, this passage from chapter seven of 'Lightning Ridge', where Idriess decamps at night from unhappy employment, his meagre goods and chattels carried in a portmanteau. "The portmanteau was a tragedy both to carry on the shoulder, and to own. To carry a port in the bush was ridiculous, apart from being a big physical strain." Cartwright, Max. Ayers Rock to the Petermanns.54-59. Gill, Walter. Petermann Journey.9,16. Kimber, R. G. Man from Arltunga.87-102. Lasseter's Diary.23,39,40,70,72. Ion Idriess, Lightning Ridge, 49.